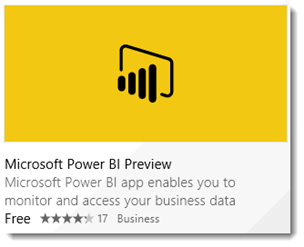 We currently have two different Power BI Apps within the Windows Store. I wanted to point out the difference between them and to indicate what will be happening. This Microsoft Power BI Preview app is for the new experience of Power BI that is currently in Preview and you can go sign up and use at http://powerbi.microsoft.com. 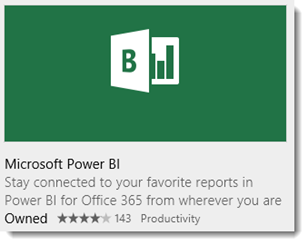 This app is labeled Microsoft Power BI and if you can tell from the icon, it is for the Power BI for Office 365 service which has been in place for about a year and a half now. This is the old service. As we get closer to General Availability (GA) of the service, and move out of preview, we will rename the new Preview app to the full name Microsoft Power BI. As part of the Power BI service and app evolution, we will be removing that old app from the Windows Store. Will I still be able to use the old app? The short answer is yes! We will just be removing it from the Windows Store. If you are still using the old app against the Power BI for Office 365 service, you can still use it. It will not be removed from your machine. Can I get the old app later if needed? Yes! You can get the old App by contacting PBIforO365Win@microsoft.com. If you have any questions, feel free to submit something on the Community site, or leave it in the comments below!